Happy new year! We kicked off the year focused on Applicant Tracking improvements to save you time recruiting while offering a more enjoyable candidate experience. 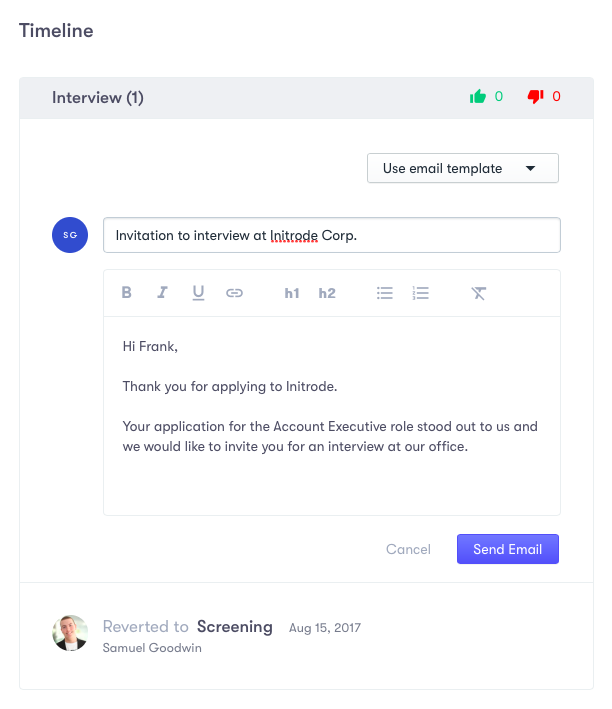 You can now start the conversation with your applicants right from Collage and then reply to their emails from the platform or your personal inbox. 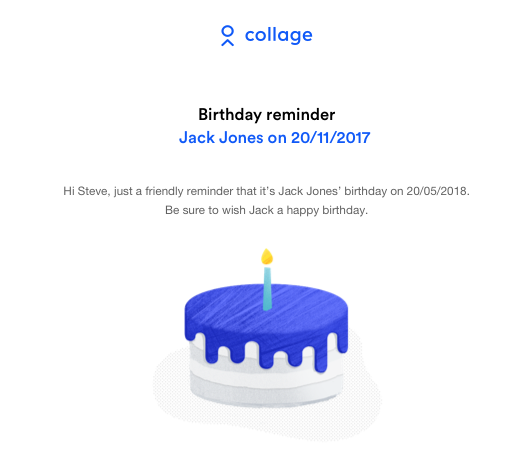 No matter where you reply, you will see the thread of emails under the candidate's profile on Collage. 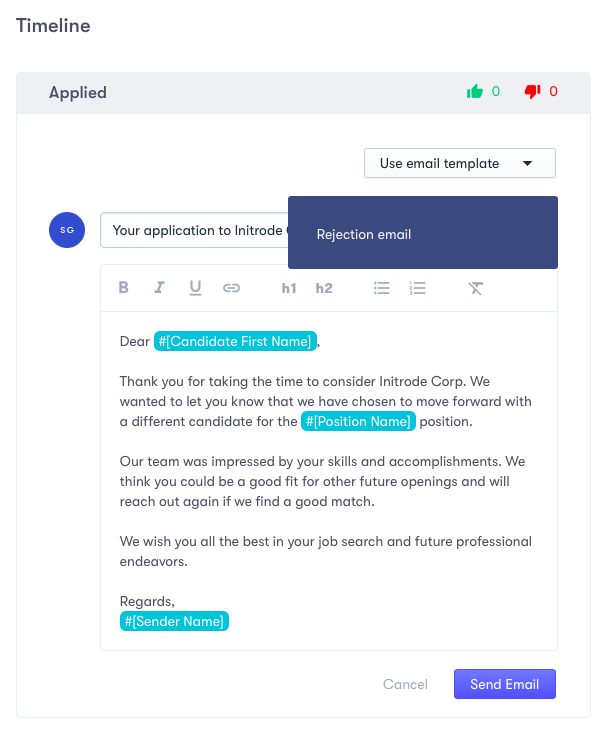 If you have standard emails you send to your candidates during the hiring process, you can also create email templates for quick replies. 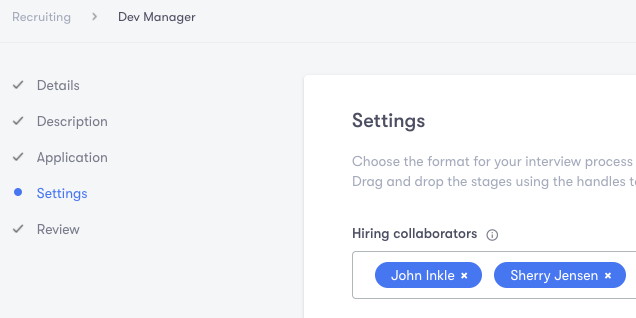 Additionally, templates could be configured to use our dynamic fields to merge text in the email (similar to the ones you have for your company document templates). 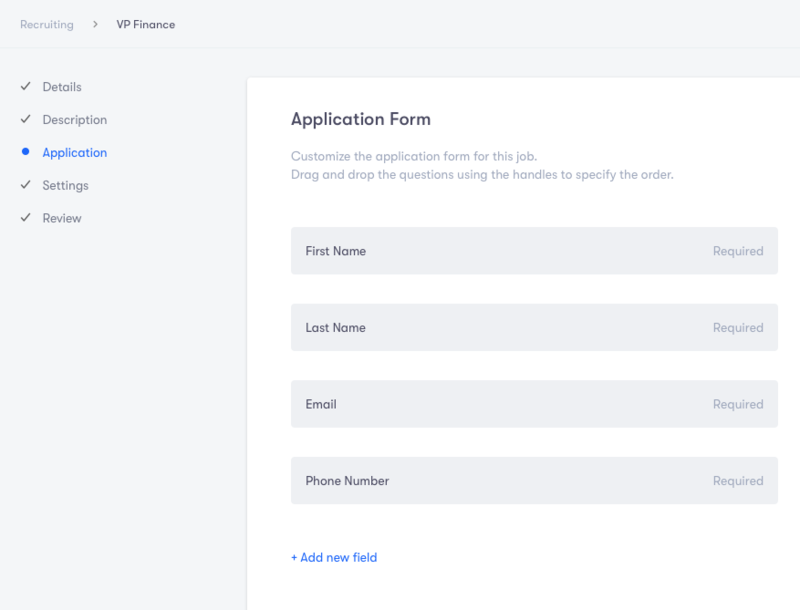 When creating a new job position, you now have the ability to customize the application form to suit your hiring process and gather the right information. 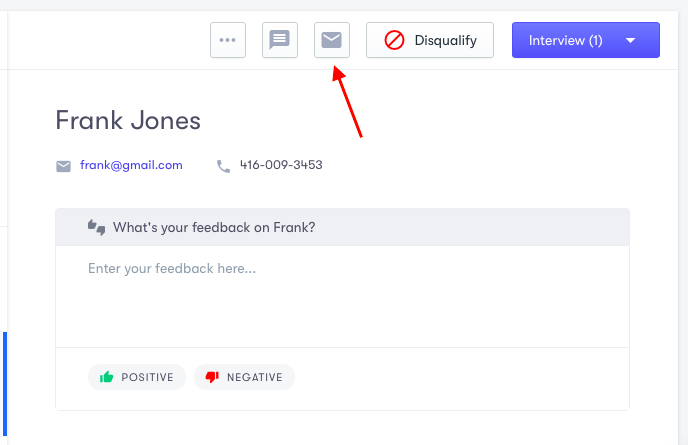 Hiring collaborators now receive a daily digest of candidate activity so you don't need to be logging in to check who has applied. Draft: Jobs you have not finished configuring are left in draft; you cannot put a job back into draft. We recognize that keeping your team informed and providing them with the relevant tools is important to you. Now people can see full details of the time off policy they are enrolled in right from their profile (by clicking on their time off balance). 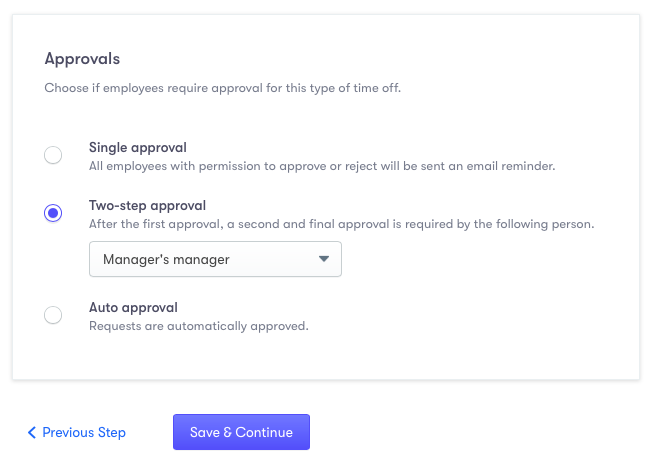 To have two people approve the same time off request, enable a two-step approval option in your policy settings. 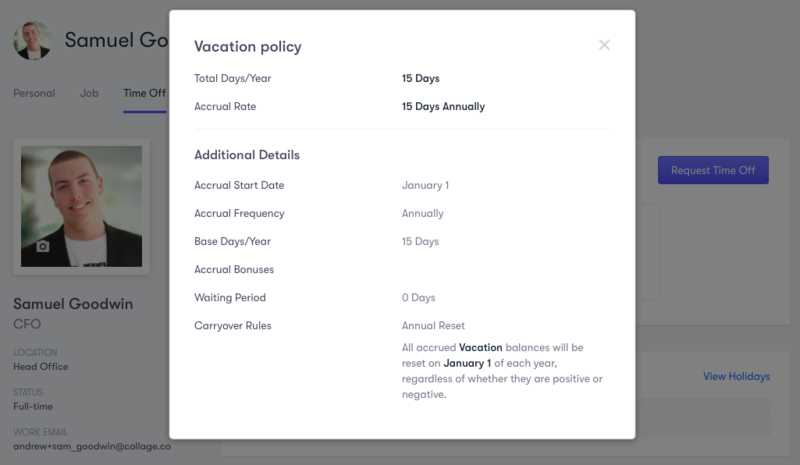 Approvals are managed on a time off type level, so you can, for example, only enable it for your vacation requests and leave other PTO as is. In addition to the two-step approval, you can also have an auto approval set for your requests. This is especially useful for the "Working from Home" days or for your executive team's time off. 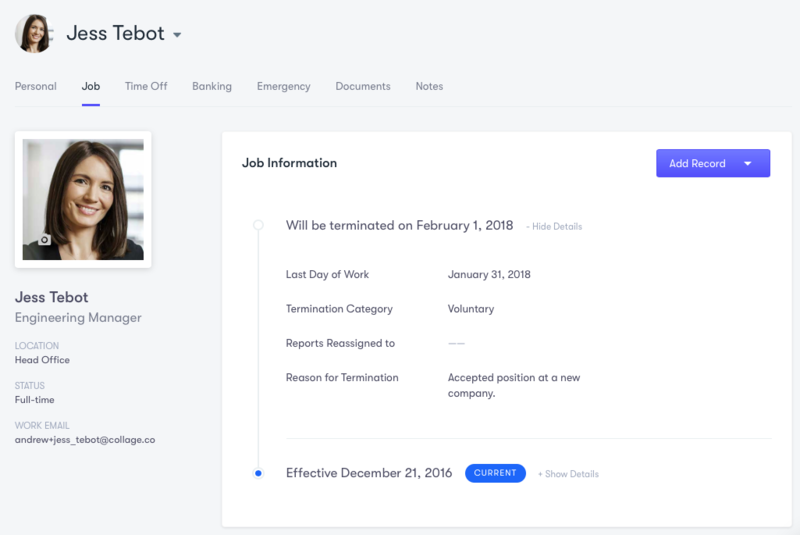 When an employee has been terminated, their employment record on Collage will now reflect this change. Of course, we recognize that involuntary terminations are best handled in person and so any scheduled terminations are not visible to the employee. 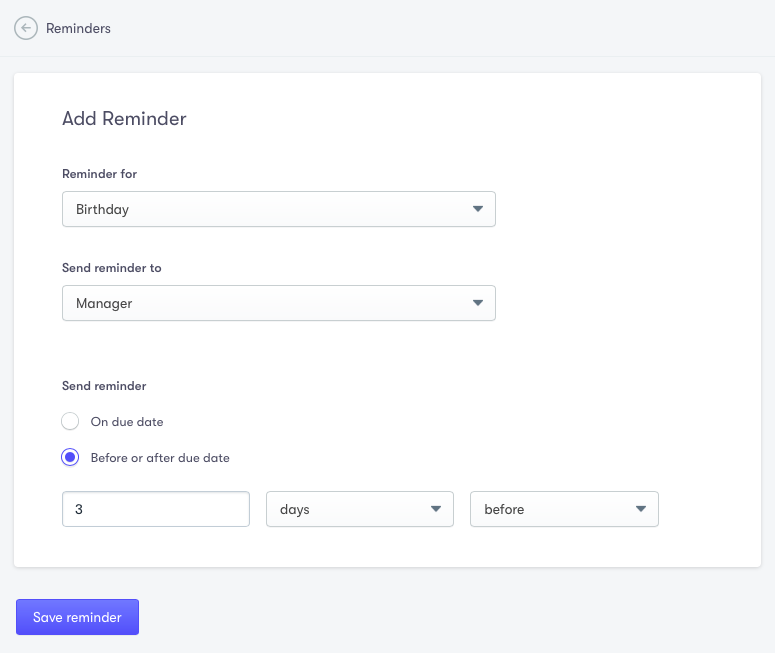 We've heard how much you love our reminders feature, especially for tracking document expiration dates. Well, there is no reason to miss someone's birthday or work anniversary. Add these reminders now and receive beautiful emails later! When employees submit new TD1 tax forms, a payroll update will be triggered in the system so you can reflect the changes in your payroll software right away. To help you have the whole team on the platform, we now send a daily onboarding reminder to people who haven't completed their onboarding. The link to continue the process is also provided for their convenience.